Welcome to What Should I Read First? A series dedicated to figuring out where to start in those series that just seem insurmountable. If you have an idea of a series I should tackle, send me a message and I’ll work to get right on it. Please note, it can take some time if I haven’t yet read the series, and you might not love what I answer–I tend to be really into certain things, and not into others and sometimes my recommendations may not mesh with yours… But that’s the magic of reading, right? Everyone has an opinion and gets inspired in a different way. Star Wars. It’s such a diverse and large universe. And that’s even speaking without the books. It is hard to believe, but this setting has only been with us since the late 70s, and yet it is still so relevant today. Which is, of course, awesome. Now, I’ve been reading Star Wars books since I was twelve or so, but that’s considered a little late now. I won’t be talking about the kids books (Origami Yoda, Force Academy, etc), but I will start off with a few things I read and a few things I stayed away from. Wookiepedia has a comprehensive timeline of the books–check it out by clicking this link (and imagining Chewbacca noises). Note, I will be adding links below, from Amazon. You do not need to buy these from me, but every time you click and buy from my affiliate link to specific books I will get a small fee to help keep the site running (at no extra charge to you). I first saw Star Wars books in my local Waldenbooks at the mall. And I was intrigued by the concept (this is also right around the time I realized that there were Star Trek books as well), so I picked up Truce at Bakura by Kathy Tyers. This takes place RIGHT after the end of Return of the Jedi. As someone who likes to start from the beginning, it made a lot of sense for me. Additionally it paved the way to The Courtship of Princess Leia by Dave Wolverton–this is one of my favorite Leia-centered books. Sooo awesome. From there, I would strongly recommend the Thrawn trilogy by Timothy Zahn–those books are Heir to the Empire, Dark Force Rising and The Last Command. Zahn is an absolute master of Star Wars. I need to point out that when Disney bought Star Wars many of the books and characters were relegated to that ‘It’s been written, but we don’t consider it canon’ category. Zahn’s Thrawn actually shows up in another Disney show (a cartoon, pre Star Wars: A New Hope) AND just had a new book published about him (called Thrawn). Additionally, one of my favorite Star Wars characters of all time is in the original Thrawn trilogy–Mara Jade. I could fangirl here forever, but I’m just going to say it’s really worth reading the Thrawn trilogy. Thrawn is the first character from the old series that wasn’t going to be canon to move over to Disney’s Star Wars… Let’s hope he’s not the last. We all know from the movies that Leia and Han procreated. The Young Jedi Knights series takes Han and Leia’s twins and puts them in a Jedi school run by Luke, himself. A lot of these are out of print, and I really wish that there were digital editions. For a long time, this YA was the only glimpse of the new twins and the rebuilding of the Jedi temples and academy. It’s a cool series, with some characters that ended up in further series. Tenel Ka rocks… That is all. For something lighter, The Coruscant Nights series is a great mystery/noir series. And there’s always books like The Han Solo trilogy or the Lando Calrissian Adventures to make things just a little more fun. My husband swears by the X-Wing series, but I wasn’t a real fan of the X-Wings to warrant reading the books–but they are solid to read for the flight enthusiast. The one time I went to SDCC, I got a copy of The Choices of One and I even have the shirt that is designed to look like the cover. I recommend reading Survivor’s Quest by Timothy Zahn BEFORE you read The Choices of One. I am also going to recommend Kenobi in this lighter listing–as it details what happens with Obi-Wan in between episodes III and IV and how he came to be that crazy old guy on Tatooine. Note, this is as close to a western as I am apt to read, and the character of Kenobi shines within this novel–like a freaking force beacon! Now, just before the Disney buyout, there were two really large series that finished that some had speculated were going to factor into movies after Episode VI–with Legends, the studio decided a different direction for the movies (but people wanted filmic versions of these, nonetheless)–The New Jedi Order, Legacy of the Force and Fate of the Jedi. I have yet to finish the Fate series, mostly because I ugly cried my way through part of one. These are, in order, a great story about where the Jedi went and then how the Skywalker/Solo family shapes the ways of the Jedi and the Galaxies within that future. Again, I love these the most, because I was so immersed in them for so long, but I can’t say that I want to finish them just yet–need to get into a different headspace. For the gamers, there is a full novelization of The Force Unleashed game, as well as the sequel. And, there are some awesome Tales from the Old Republic books that I feel should get more love. Of course, what I’d really like, is to go back to Star Wars Galaxies and hang out dancing at the clubs, but we all have dreams, right? 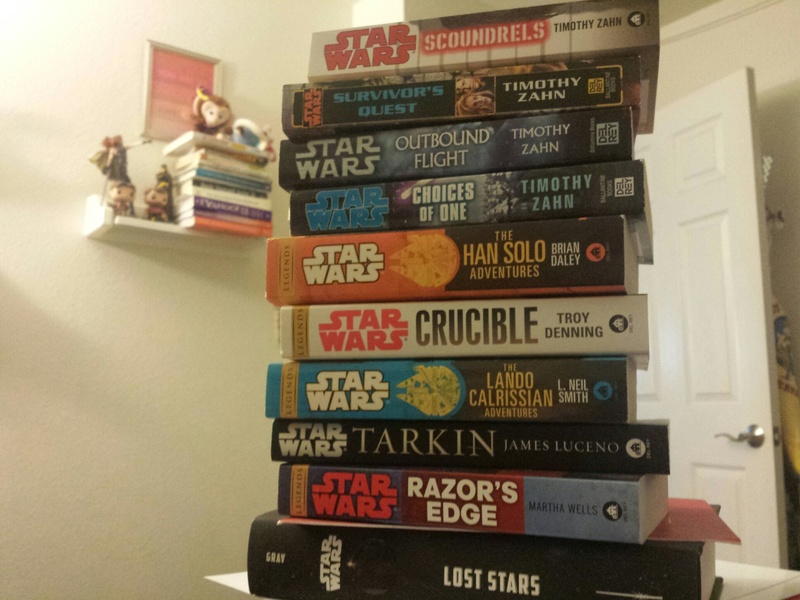 There’s also two books based on the Battlefront game that I have not read. I’m going to add Death Troopers and Red Harvest to this list–they are horror novels, set in the Star Wars Universe, but apart from the Bor gullet these are the creepiest things in the Star Wars universe. Dark Disciple is based on some scripts that were not produced for the Clone Wars animated series–it’s a bit darker than I expected, but nice in its own way. One novel not to be missed, speaking of other characters is EK Johnston’s Ahsoka. Rogue One has a novelization, and a book about Galen Erso called Catalyst that is a must read, too! Finally, with the new movies, the team at Disney is doing something really cool. It’s called ‘Journey to Star Wars’ and features a series of books that contain the novelizations of each of the movies (which have added things that we haven’t seen in the edited movies, but that were included in the original scripts), along with a grouping of books about the characters within the movies. The Aftermath Trilogy is a MUST read–it takes place in between episodes VII and VIII and features a pretty awesome cast of characters and sets up a few things for Episode VIII and beyond we’re still hoping to see. Claudia Gray’s Lost Stars is a bit more YA than I thought it would be, but sets up the rebuilding of the Imperial army. Bloodline tells the literary story of what Leia has to do when her family’s backstory is found out, and should not be confused with a novel called Bloodlines in the Legacy of the Force series. Gray also wrote Leia, Princess of Alderaan which is a lead into Episode VIII and introduces a MAJOR character and lays the groundwork for said character’s role in episode 8. Phasma is also a great lead into the titular character and I felt like it was a book that was completely overlooked. Canto Bight is a series of short stories about the land everyone in Star Wars knew about, but that no one in the audience had any clue about. We’ll just have to see what Episode IX has in store for us in the way of books–have any ideas about what is missing from this list, or the kinds of stories you are hoping to see? Sound off in the comments below!